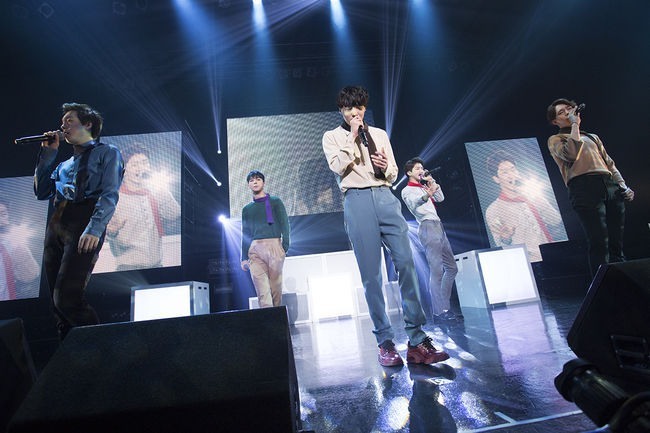 WINNER finished its “WINNER 1st JAPAN TOUR 2014” with a final concert in Tokyo over the weekend, drawing a total of 50,000 fans to 11 concerts in Japan. More than 2,600 fans gathered to see WINNER’s final concert, a performance on a stage that resembled the streets of New York. On stage, they performed their hits “GO UP,” “Empty,” and “Color Ring.” There were also solo performances by Song Min-ho and Nam Tae-hyun, and collaborations between the members. “I believe, we, WINNER can be united as a whole through music, and I’ve seen the power of music on this tour. We still have a long way to go but we promise that we will always work harder,” the group’s leader, Kang Seung-yoon, said at the end of the concert. When the fans held up a placard saying “Thank You, WINNER” the group members even shed tears of gratitude. WINNER took second place on Oricon’s “Daily Album” and “Weekly Album” charts with their debut album “2014 S/S -Japan Collection-,” proving its popularity in Japan. After their Japan tour, WINNER attended Big Bang member Taeyang’s solo concert at Seoul Olympic stadium on Sunday.